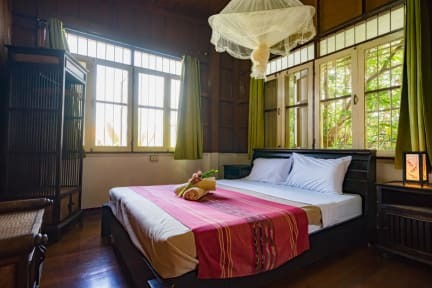 Luna guesthouse is a clean, cosy, thai style wooden house located in a pleasant quiet soi just off the bustling Thapae road, approximately 3/4 minutes away from Tha Phae Gate where the famous Sunday Market takes place. 5/10 minutes (depending on how slowly you walk.) brings you to the Night Bazaar. We are perfect for those who want to be in the hub of everything but also want to enjoy a quiet retreat to relax with our central location we offer just that. Luna guesthouse 2 has 4 double bedrooms, 1 twin bedroom and a 4 bed mixed dorm room available. They are all private non smoking rooms with shared clean bathrooms (there is plenty of covered shelter in the garden lounge areas for those of you that are smokers). 2 double bed rooms and the 4 bed dorm room are upstairs in the house and the rest of the bedrooms are in the garden annex. The double bed rooms have comfortable queen-size beds; the twin bed room has two single beds and the 4 bed dorm consists of 2 bunk beds. All bedrooms have air conditioning, a wardrobe, side tables, reading lights. The dorm room had lockers with keys for valuables. There is a pleasant garden where you can relax and get acquainted with nature, squirrels, butterflies, geckoes and an assortment of birdlife all make an appearance. Innumerable Tuk Tuk's and Song Thaew's (the red trucks) are available on the Tha Phae Road which enable you to reach anywhere (within reason). If you need to go farther afield the Arcade Bus Station, Train Station and Airport are between 15-20 minutes away. - We do not take in check in's early than 8 am. If you will be arriving after 7 pm please let us know by phone or email. So we can arrange a self check in. -If you do not inform us you will be arriving after 7 pm we will assume a no show. 2. Check-out time is at 11 am. 3. Cancellation policy: At least 2 days advance notice before the arrival date is required. 4. Please do not smoke in the bedrooms or house. (1) A covered area for smoking is available in the garden. (2) Please be considerate to non-smokers. 5. Please keep noise levels down after 10.30 pm at night and be considerate of other guests. I had a very nice stay at Luna Guesthouse! 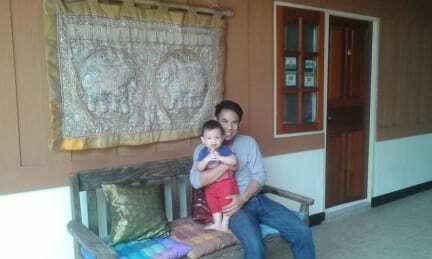 It's a clean, cosy and quiet place to stay just outside the citywalls of Chiang Mai. Kischa (the owner) is a very friendly lady who will help you with anything you need. I felt welcome and at home during my stay. The guesthouse is run by a family, that makes it a unique experience. I would definitely recommend Luna Guesthouse!